Bleu Paw is a quick, easy, and sanitary way to pick up your pets deposits while keeping your hands and device from ever touching dog poop. 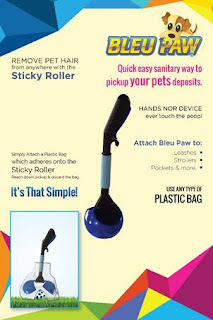 This works with any plastic bag in this ingenious gadget also locks into your pets deposit by the clause providing relief by putting an end to walking with a poop bag in hand until reaching a garbage can. With a superior design is compact 12.5 inches in lights making it perfectly convenient to keep at home and in the car. This also has a LED light which helps you spot poop during the late night walks. My Opinion: I really am impressed with the design as I can just clip it to my belt loop in a way I go. I also like the LED feature because I do have to take my dog out at night to go to the bathroom and this is very helpful to be able to see as I live in a rural area and it gets very dark here at night in the woods. I did find the device easy for picking up my dog's poop I do worry about the way it locks into place as it’s just a small thin other than that it is a great tool to use. To see more visit https://bleupaw.com you will be able to purchase this after September 12, 2017.